1 of 5 Mix flour, salt, black pepper, red pepper and nutmeg on a plate. Place bread crumbs on second plate. Beat eggs lightly on third plate. 2 of 5 Cut tenderloins from each breast half; set aside. Cut one of the breast halves lengthwise into 4 or 5 pieces. You should have 3 to 4 whole breast halves and about 9 to 10 fingers, including reserved tenderloins. 3 of 5 Coat each piece of chicken with flour mixture, dip in egg, and roll in bread crumbs. 4 of 5 Heat oil in large skillet. Add chicken breasts and fingers; saute over medium heat for about 3 to 4 minutes on each side for breasts, and 2 to 3 minutes per side for fingers, or until internal temperature registers 170 degrees F on instant-read thermometer. Cook in batches if necessary, adding more oil as needed. With slotted spoon, transfer chicken fingers and breasts to paper toweling to drain. 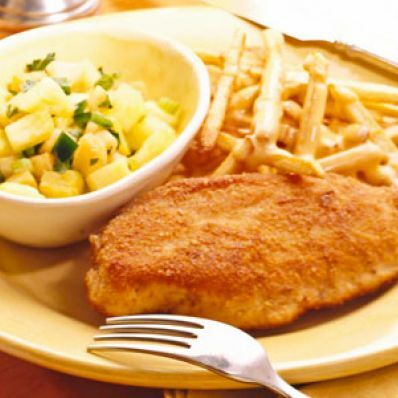 5 of 5 Serve breasts with Pineapple-Melon Salsa and Cheese Fries. For children, serve fingers with ketchup. Makes 6 servings.